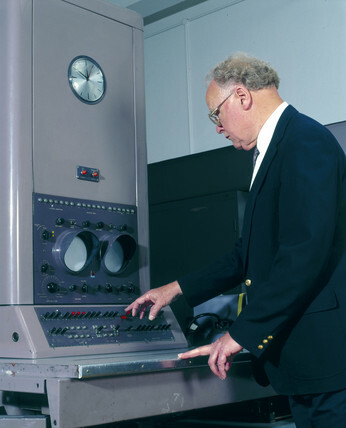 This computer, the 25th Pegasus machine to be built, was delivered to Ferranti's agent in Sweden in 1959 before being returned to their West Gorton factory in Manchester in 1960 for computer-aided design tasks. In 1963 it was donated to University College London for x-ray crystallographic research, and in 1983 it was donated to the Science Museum. Re-commisioned by ICL in 1984, it was returned to the Science Museum in 1988. The photograph shows the computer with a member of the Computer Conservation Society in 2000.